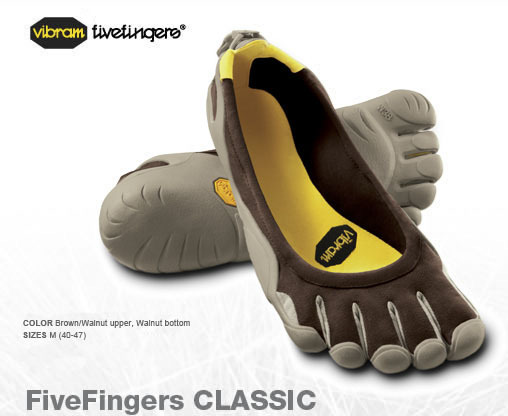 Few items of footwear are as odd-looking as a pair of Vibram FiveFingers. Designed to mimic the experience—and benefits—of running (or walking) barefoot, FiveFingers provide a form-fitting, thin layer of protection underfoot to keep your tender, shoe-loving soles from becoming too battered by the environment. The premise of barefoot running is simple. For thousands of years, our prehistoric ancestors ran around without any shoes. Therefore it makes sense that our bodies are adapted to this form of locomotion. And that running shoes may change how we run—with potentially deleterious effects. The most striking example of this is the fact that since running shoes first appeared in the late ’60s and early ’70s, the incidence of running-related injuries (joint problems, stress fractures, etc.) has remained essentially unchanged—despite all the new-fangled materials and design technology that has been incorporated into running shoes over the years. The barefoot running research of Daniel Lieberman, a professor in Harvard’s Department of Evolutionary Biology, provides a potential explanation. When you run in shoes, your heel strikes the ground first, producing an abrupt shock that is translated up your leg and through your joints. Over time, these cumulative impacts take a toll on your bones, joints, and muscles. All the shoe technology in the world won’t change this basic ergonomic, heel-strike-first aspect of modern-day running. Another argument for barefoot running is the increased use—and strengthening—of muscles in and around your feet and ankles, which improves balance and stability. When you wear shoes, the support and structure they provide reduces the need to use your foot and ankle muscles, resulting in a weaker and less stable situation. A major drawback to barefoot running also has to do with the modern age: concrete and asphalt. Our ancestors didn’t run on these hard, hard surfaces, and likely kept to more forgiving packed earth. Given that, I wonder if barefoot running might not be such a good idea if you stick primarily to streets and sidewalks, instead of trails or other packed-earth venues. 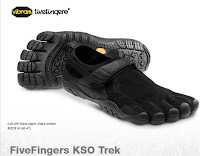 If you want to try it out yourself, you have a range of FiveFingers styles to choose from, from the Classic ($75) to the more secure and protective KSO Trek ($125). Check out all the styles here, including the special fit information for sizing FiveFingers properly.